In the summer of 1941, St. Louis County, Minnesota, was an industrial area known primarily as a source of raw materials and steel; for shipbuilding; and for having one of the busiest ports on the Great Lakes. The nation’s three most abundant veins of iron ore were located in the northern part of the county, on the Iron Range. A railway connected the Iron Range to the “Twin Ports” of Duluth-Superior, allowing the transit of huge quantities of raw materials south from the Range through the port and out to the Atlantic Ocean and beyond through the chain of the Great Lakes and its canals and locks, known as the St. Lawrence Seaway. When the Japanese launched a surprise attack on Pearl Harbor on December 7, 1941, the federal government recognized the potential value of St. Louis County to the war effort. The FBI sent agents to make a sweep of the region the next day, December 8, in order to evaluate the county’s war assets and potential threats to their safety. An assessment of the region made it clear that any single enemy strike or act of sabotage—against railroad tracks, a mine, or a shipyard—would not disrupt the county’s overall ability to sustain military production because resources and production facilities were highly diversified. Coal docks, steel mills, fabricating plants, scrap iron piles, ore docks, cement plants, grain elevators, and flourmills were widely dispersed within a 250-square-mile area. Three separate watersheds provided water to the county, and the power grid, too, was strengthened by means of diversification. Other precautions were also taken to secure St. Louis County following the Japanese attack. The Coast Guard increased the number of its patrols on Lake Superior. Civilian planes at local airports were temporarily grounded. Many radio stations were voluntarily shut down, creating a temporary communications blackout. The lights at Enger Tower, a landmark sitting high on a hill, were turned off. The bombing of Pearl Harbor aroused patriotic feelings among many in the county. Men and some women began to enlist to serve in the newly declared war against Japan and Germany. A parallel home front war effort began. The might of the mining industry was harnessed and dramatically expanded to mine ore and to produce steel for tanks, ships, and weapons. Remarkably, two of the three iron ore ranges, the Mesabi and Vermilion, alone produced two-thirds of the total iron ore consumed by the American steel industry from 1942 until 1945. Steel was the backbone of the war effort, and its primary source was St. Louis County. 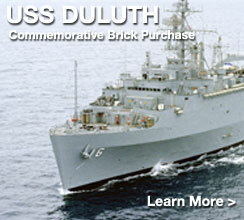 Another huge impact that Duluth had on the war effort was in shipbuilding. Initially, six shipyards in the Twin Ports produced Coast Guard cutters, but later made freighters, tankers, and cargo carriers as well. More than 230 vessels were built in Duluth, and existing Great Lakes freighters were called into military service. Some ships that were too long to navigate the St. Lawrence Seaway had travel to the ocean via the Illinois and Mississippi Rivers. During World War II, women worked in the Duluth shipyards for the first time. They made up one quarter of the entire workforce, about 3,500 strong. Although respected, women were not treated as equals in the shipyard and were limited in terms of both earnings and the type of work they were allowed to do. Even with these limitations, however, the manpower shortage and the opportunity it provided gave some Twin Ports women a new sense of freedom: they did important work outside of the home, and they were compensated, some of them for the first time. In the mines of the Iron Range, too, women had new opportunities for work during the war. In 1945, 163 women and 8,500 men worked in the mines. This employment of women by mines was unprecedented. The women were paid the same as men doing similar work, but they were clearly temporary workers. Women worked alongside other women in the jobs that managers thought they could handle: tending conveyor belts and crushers, laying tracks, sampling ore, and timing trucks carrying loads of overburden to the dumps. They did not work in the pit. For the women workers, the mines provided a great opportunity, since mine workers brought home almost double the average income of female manufacturing workers. Other civilian activity on the home front also supported the war. Civilians planted victory gardens; purchased war bonds; helped with metal and rubber drives; and sent letters and packages to loved ones in the service. A letter from a service member serving abroad was a cause for joy. In local communities, surprise blackout tests were held in order to practice for potential enemy bombings during the war. A town would be warned that sometime within the next several days, it would be ordered to go into blackout mode, turning off lights and pulling blackout curtains in order to “hide” a town under veil of darkness and so prevent being a civilian bombing target. Virginia was the first community to have a blackout test, on July 15, 1942, at 10:45 p.m. They passed. Other communities were not as successful. Despite the forewarning, Eveleth was unprepared for the surprise blackout on August 24, 1943: All of the streetlights were left on, and they could have been “virtually wiped off the map” had there been a real threat. Small communities on the Iron Range did what they could to provide support for the war effort, including forming defense councils. The duties of these councils included organizing in case of attack and providing news and support to the hometown men fighting abroad. Newsletters such as the Zim Zips, Pike Town Patter, Alango Newsletter, and Sax Chatter Box provided news of marriages, deaths, births, and travels of locals. These letters gave a taste of home to those fighting. Fortunately, no enemy attacks took place in St. Louis County during World War II. But owing to its strong industrial base, the county provided a unique home front experience during World War II and one that had direct impact on the prosecution of the war. Shipbuilding and mining provided valuable materials for the war effort, and the region took care to prepare itself in the event of an attack. New opportunities for women in the workforce gave them a sense of freedom and empowerment in tough times. As a diversified region, St. Louis County was a strong contributor to the war effort.